Karin Sprague, who creates tombstones with extensive carving at her shop in Scituate, Rhode Island, said her ultimategoal is to forge a client's grief into a fitting remembrance. She spent six hours in her first face-to-face meeting with 40-year-old Jackie Finken, whose husband, Lt. Col. Paul Finken, was killed in November 2006 by a roadside bomb in Baghdad while deployed with the US Army to train Iraqi troops. 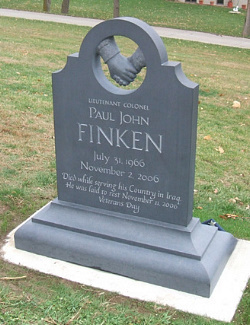 Paul Finken's slate marker, placed in Earling, Iowa, in early November, is carved with two hands clasped together and suspended in air. The words "Honorable, Humorous, Loving, UNFORGETTABLE" are on one side. Hidden on the marker are three tiny carved sunflower seeds, one for each of the couple's young daughters. "She wrapped her arms around us and walked us through a year of grief," Finken said of Sprague. "And were left with this beautiful, beautiful piece of artwork that I think symbolizes him well." For that, she said, price never even entered into the equation. She has not revealed to anyone how much the tombstone cost. "I can't put a price tag on my husband," she said. "One way to look at it is, it's a lifetime of birthdays and Christmases and things we'll never have together. It was my last gift to my husband, and I wanted it done right." "Words cannot describe the depth of my appreciation for the efforts of you and your team. There is now an element of joy associated with Barbara's passing. Her aesthetic has been captured and preserved in the most beautiful way. Peace has entered my life equation, thanks to you!" — Forever grateful and with love, Steven E.
"Karin, thanks for your wonderful presentation to my class on Mercy. You provided us with some great ideas for reflection and discussion. I continue to appreciate the beauty of your craft and life and the gentleness of the spirit that flows through you." "I wanted to write to you on fabulous stationery. I wanted to write poetic words of thanks; but none come because words cannot express the perfection you created. Words cannot express the perfect journey you led me on or through. Words cannot express that my soul is a little less heavy, a little bit freer. Heartfelt thanks & gratitude, and I look forward to a long friendship." "It is truly elegant in its simplicity, as you had predicted it would be. And your installation was nothing less than masterful! I particularly appreciate the care you took in leaving the site looking so undisturbed and in surrounding the stones base with the little ferns and moss. This extra touch makes the stone look like its been there for years." 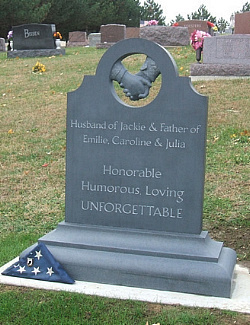 "My Mom cried when she saw the headstone, she thought it was so beautiful. Thank you for everything." "Let me just say that I feel so fortunate that together we were able to create a loving memorial which honors Wylie. It speaks of him, his strength, wisdom, beauty and the power of our love. Thank you , Karin. We are so grateful. You are so very gifted, Karin, and as I trace my fingertips over your carved letters, Wylie's symbols, the feather, I feel strength, love and I gather energy. Carpe Diem, my friend." Do you love our stone carvings? So, you share a passion for the art of rememboring life. If you are thinking about creating your on custom piece for yourself or a loved one, start by clinking the icon to the right.